Happy 64 oz. Growler day, everyone! Just in time for the big 4th of July weekend are two awesome bottle releases in Florida. The best part of these is they’re not wait-in-line, limited to the first 20 people bottle releases. They’re all-inclusive, and I like that. First up for readers in South Florida is Blueberry Cobbler (Fruit Ale, 5.4% ABV, 12 IBU), Funky Buddha’s next seasonal 4-pack release after the massive success of More Moro. Blueberry Cobbler is currently on draft at Funky Buddha itself, but if you’re impatient, you can always head to the brewery on Saturday and pick up a 4-pack for $11.99. 4-packs will appear in better beer retailers around South Florida not too long after that. If you’re not in or around Oakland Park, BrewHub has you covered. Just in time for the 4th, they are releasing 22 oz. 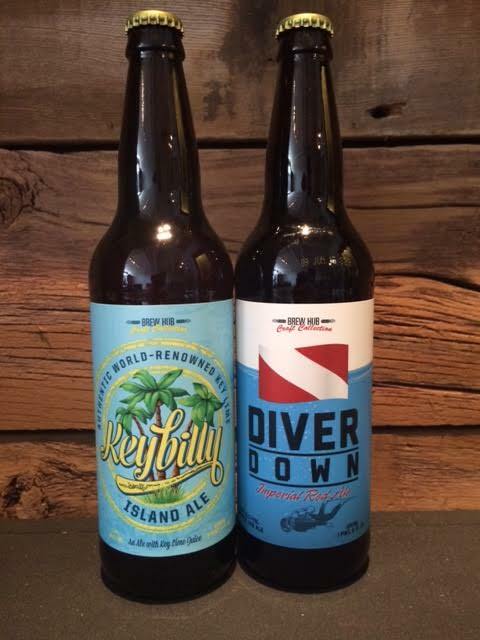 bombers of both Diver Down (Imperial Red Ale, 8.5% ABV, 40 IBU) and Keybilly (Amber Ale, 5.4% ABV) at every Publix grocery store in the state. All of them. It’s only for the month of July, so make sure to get to Publix and grab a few. All of the beers above are fantastic for a Florida summer cookout, and they’ll go great with whatever is in that new 64 oz. growler you just got, too. Cheers!